In an age of mobile applications and connected devices, the ability to access your data remotely is more important than ever. 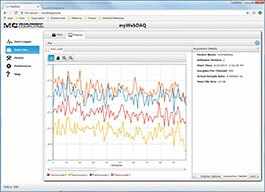 WebDAQ offers a new data logger architecture that allows configuration and access to the data from anywhere in the world. WebDAQ Series internet data logger devices offer a complete and easy-to-use remote data acquisition solution. With an embedded web server, users can configure and run simple to complex data logging operations, log data, set alarm conditions, and view the data in real-time from anywhere on an internet-enabled device. Record all the data you need with 3GB of internal storage, SD card input, and support for USB flash drives. Data can be viewed and downloaded remotely and can be converted to .CSV® files compatible with Microsoft® Excel® and other analysis software. The WebDAQ Series provides an all-in-one package with no software to load, and no additional hardware to buy. 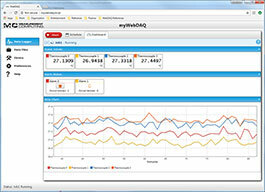 The WebDAQ web server is optimized for both desktop and mobile devices. Users can perform acquisition and web data logger tasks from phones, tablets and laptops with a single, intuitive user interface. Synchronizing data to an event of interest is critical to many data acquisition applications. The WebDAQ supports both triggers and alarms to respond to event conditions, control digital outputs, and send notifications through email or SMS messages. Built on Linux® and a quad-core embedded processor, WebDAQ provides a platform for future expansion. As the Internet of Things develops, WebDAQ will add features to support it. Jobs are the building block of WebDAQ. The ability to define different data logging jobs, or tasks, and add them to schedules unleashes flexibility not seen in any other remote data logger. Whether you want to set up a simple logging task or a complex task, jobs and schedules make it easy and straightforward. 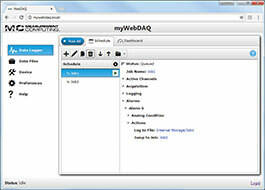 The basic building block of WebDAQ, a job defines channel configuration, logging options, start and stop conditions, and alarming. A Schedule is a collection of jobs that gives flexibility to dynamically change data logging attributes, such as sampling rate, active channels configuration, or alarm levels. Switching from static acquisition to dynamic acquisition. Users can easily setup a job for a slow, static acquisition and a fast dynamic acquisition. When a trigger condition is met (i.e. over/under alarm), Job 1 (slow acquisition) ends and Job 2 (fast acquisition) begins. When the trigger condition returns to normal, job 1 can be restarted. WebDAQ users don’t need to rely on the small screens and difficult to navigate displays of most other loggers. With WebDAQ’s intuitive web interface, users can easily see their data and alarm conditions in real time or after the acquisition is complete. WebDAQ products provide high quality measurements so you don’t have to compromise between accuracy and convenience. Buy with confidence with a 30-day money-back guarantee.